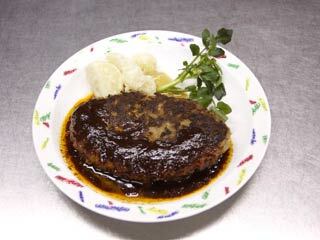 Japanese Style Hamburg is one of the popular daily dishes in Japan. The unique feature of Japanese Style is using the combination meat of Beef and Pork. There are many way to cook it and it fits many sauce style, such as ketchup, Soy sauce, or cheese. Then, add Onions on the meat. Let's divid them and make them in to a pieces. I'd love to make it little bigger, so make it size of a soft-ball. Pass it on the hand like this to take out the inside's air. Make a dip in the middle later. That's it. Now time to grill. Fist of all, put oil and heat oil and a pan. Use a strong fire. Make sure the pan is well heated. Then, make a dip in the middle of the meat. When one side is well grilled, flip it and change the heat to small. Then, put a cover and cook it. Change the fire to small. Time to open. Let's see how it cooked. Push it, and if there is no blood seeping, the it's cooked. Move it on the dish. We are going to use the juice of the meat. So, keep it. Let's make a sauce with the juice. First, add the red wine. Boil it until the half of the wine vapored.